Parker, left under the supervision of my father... equals Parker hanging out in a box in the middle of the living room. He didn't like it at first... but after a few minutes didn't think it seemed to bad and actually cried when we took him out! I'm waiting for the Christmas I find Parker hanging from the door frame in an extra large stocking. Still scared from the experience myself... I wonder what Parker will think of it! Having lost baby weight... my creative side is eager to dress like it used to. Dresses, tights, tunics and belts, jackets, ect. However, I've encountered a couple problems. 1. Half of my wardrobe I don't want to have dry cleaned or ruined, due to crazy amounts of puke. When wondering what to wear for Christmas Eve festivities... I stumbled upon a pile of free 'Kenzie' dresses that were once samples. This dress happened to have a slit in the back, so we patched it with duct tape. I liked the color well enough and loved that it had pockets... but how would I feed? Loving raw zippers, I knew that's what it needed. So... I did it! My first zipper attempt, no directions and I didn't even have the zipper foot, attachment. Here are the before and after photos. It totally works, looks great and I can't wait to find my next project that needs a zipper! Passion... what is it? It's a driver, it's fuel, it creates desire. In the last year, my heart has been bloating full, cut wide open, emptied out, sewn shut and filled again. It's all been for a greater good even if it was momentarily, ugly & painful or felt so ecstatic that I thought I might LITERALLY implode. Passion... has aided in my growth as a women, wife, mother and leader in society! Lately, my own personal experience looks something like this. 'When one is passionate about something or someone, you want to share it or share in it. You learn everything about it, buy all it's books or products and surround yourself with things that are it or remind you of it. And then what do you do with all of this crazy passion and knowledge? Do you sit on it? Do you keep it confined to the walls of your home, office or small group of friends? Would the world be a better place if it knew what you knew? Could you simply living out your passion or sharing it make a difference in just one person's life? I challenge you, myself included to dive head first into your passion. To eat it up as if it were your last meal. To double fist it like it's last call. And when you are busting at the seams, when your heart can contain no more... SHARE IT WITH THE WORLD! Because of his love to gorge, it often means when he burps his inner dam breaks loose and out it all comes. Thursday was one of those days. Since we weren't going anywhere, I just wiped myself off and kept right on moving. I was the one that was sour, rotten, molding and growing roots! I had been smelling myself, well really the work of Parker. Oh, the luxurious life of a mother. I ended my day of scent experimentation with sporting the pee I earned while testing to see how much pee a bare cloth diaper could hold without a cover. The answer, 1 round. Parker boy has developed a new poop habit. One that spells relief every 4-7 days. At first we were a little afraid but after some research and speaking with some professionals all reports said it can be normal for a breast feed baby. I believe I said before that he was 'all boy' when it came to this bodily function in that he has never pooped after every feeding. He prefers one gigantic explosion a day. However, that all stopped this month and we are currently experiencing what I call 'the drought.'. Do I love the fact that he's more gas than show, no... but I also have to trust his body. Don't get me wrong we are visiting Dad at the office and his atlas is holding like a champ. We have gotten some cranial sacral massages, both produced poop the next day! And Saturday we are visiting a chiro that has a Pediatrics Diplomat degree. Not just because he isn't pooping, more because his little muscles and body seem to be holding onto some birth trauma all along his left side which is probably the culprit in the poop crisis! Anyways, he pooped Thursday when we were at post-natal yoga, and we hadn't done any intervention yet that week. Friday was a hard day, he screamed most of it! He later got another massage and a kick a** chiro adjustment and went pooped again on Saturday. I am hoping we are on the up swing?! I guess my point in sharing is that it can be hard at times to trust our babies body and even our own intuition. We are quick to rule certain situations as problems and want them taken care of as quickly as possible. Ask yourself instead, what the reason or cause for the situation might be. Do you need to intervene, will it correct it's self or does it need just a little guidance? When I was reading up on 'poop patterns of nursing babies' I found lots of indication that while it is very normal, it's not as heard of today because we intervene after a 3 day drought. In some countries breast feed babies can go 1 month... can you imagine the smell of their gas after one month?! Parker's already smells like a grown mans' whose been eating bratwurst with sauerkraut and baked beans! Sunday after walking in the woods for hours we decided we wanted ice cream! There is an amazing family owned, home-made, joint right down the road from us, so we like to find every excuse we can to go get a scoop. 1 scoop... don't judge me! Parker being an Endel and all, we thought it was time for him to start choosing his own ice cream flavor. Doug asked him what he wanted and we felt like he wanted chocolate, so when we got to the counter Doug placed his order, then I placed my order... and asked for chocolate! You thought I was going to say we ordered Parker his own scoop, didn't you! Not yet, not quite yet, but very soon I'm afraid! I love when Dad comes home from work in the evening. I love that he gets to see Parker. I love watching him talk to him and seeing the smile on both of their faces! It's also nice to know that it's not just the two of us, but now the three of us. I love the weekends even more! With Doug home we dream up adventures for the three of us. Whether it's going on a walk, hiking for hours, or getting ice cream... we do it together, as a family! This weekend we did all of the above. The weather was gorgeous. The perfect combination of fall breeze and summer sun. Parker slept through most of the adventures, but we all had fun just being together. If ever the day happens that there is no longer room in the freezer for ice cold beer, we might have a problem! I fear the day I open the door and the little plastic (BPA free... don't freak out) bottles with yellow caps start falling out onto my feet. Regardless, I am saying it first here... there will always be room in my freezer for you sweet, cold, refreshing beer! Parker drenched me today. I caught most of it on my shoulder and thought that was it. A girl friend told me I had some on the back of my sweater, I cleaned it off and went on with my day. HOURS later, I noticed on the back of my skinnies... I had a GIGANTIC SMEAR OF PUKE! All I could do was wipe it off and laugh... 'Hip moms accessorize with puke', right?! As adults we strongly believe in the power of affirmations. I wonder if we would need them so badly as adults if we would have heard them as young children... even little babes. When I was still pregnant I knew early on that I wanted to use every moment I could to positively affirm my son. Not because I thought he was ultra special (event tho I do) but because I believe in the power of positive words, packed full of strength and guidance. I am currently using music and children's books to do this. Here are some of my favorites! While I still enjoy reading to Parker ">Boom-Chicka-Boom-Boom and Where The Wild Things Are, the following books are truly amazing gifts to share with any child, young or old! Marianne Richmond is an amazing author. 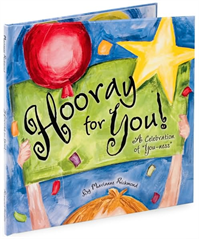 One of her books that I love is Hooray for You- A Celebration of You-ness! Here is simply one line from the book. 'For quite a long time the world saved a place. Millions were born, yet non filled your space...' How about that being said to you every day! Dr. Wayne Dyer also has some AMAZING books! Please someone rock me everyday and read them to me!!! Unstoppable Me- 10 Ways to Soar Through Life & Incredible You! 10 Ways To Let Your Greatness Shine Through. 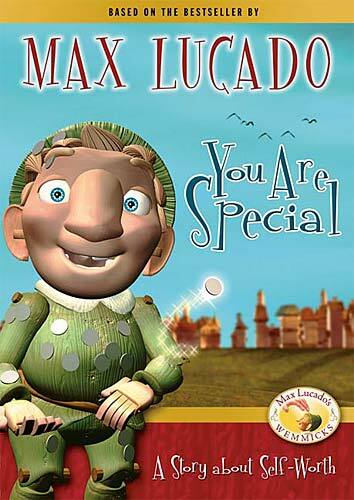 Max Lucado's Wemmicks series has four books in it (also a DVD series) with my favorite one being, You Are Special. The Twelve Gifts of Birth, by Charlene Costanzo. 'The third gift is Courage. May you speak and act with confidence and use courage to follow your own path." I would love to hear what some of your favorite children's books are! The joys of having a child, similar to those of a pet... only somehow more intense. I can remember when Pons was a puppy one day he would wake up with a horrible limp or cough and the next day it would be gone. No trace of evidence ever remained... usually just a bill! A baby poses the same types of dilemma. Should I act upon it, or is it 'this too shall pass' type of thing. Today, Parker began his 4th day without pooping. Let me start by telling you that this kid is all boy. He has a short temper like a boy (what... he didn't get it from me!!!) he sweats like a boy, burps like a boy and poops like a boy. He has never pooped after every feeding. Rather, he prefers three hard grunts and whole body crunches to fill his cloth diaper inside and out with a river of poo' lying in the liner. So, when he stopped pooping I became a little worried. I don't even think I realized he hadn't until day 2. On the eve of day 3 I began to do some research to see if this was a serious problem and if I should be doing something to help stimulate things! To me, it seemed crazy that a breast feed baby, with liquid poop could become constipated, so I was staying pretty calm about things. It also helped that he didn't seem uncomfortable at all. I did some research and it seemed ok that he hadn't gone, that breast feed babies can go weeks without, sometimes. Day 4 began with lots of grunting and gas most of the morning and at 4pm he pooped! It wasn't the blow out that I thought it might be but I was happy with the product. Dad got home around 6:30 and I ran to the store. He called me shortly after and I thought what could it be... He asked me, 'Is this a joke?' Parker had filled his pants and then some. And he had saved it for Dad! I was introduced to this non profit this week by my girlfriend and I want to share it with you! I think what it stands for is FANTASTIC! The slogan is 'Eradicating Poverty One Bead At A Time' and it does that is by buying beads that women in Uganda are making and selling them in the States and returning the money to them! Most of the women who make these beads/jewelry out of recycled paper are single mothers and/or women with HIV. Bead For Life is a way for them to make enough money for themselves to buy the medication they need to stay alive, while also providing for their families. These women feel a level of accomplishment and pride as they are able to live a life that they feared would soon be gone. Many also build the homes they live in with this income! See if you can purchase the beaded jewelry in your town or if you can host a party or how deeply you can get involved! I doubt you will be untouched or disappointed! One night last week we were eating dinner minding our own business when we realized we didn't hear Tuff. We both turned around to see what he might be into but instead we found this. Tuff, silently advertising that his Daddy is the best chiropractor around (13128 Totem Lake Blvd. 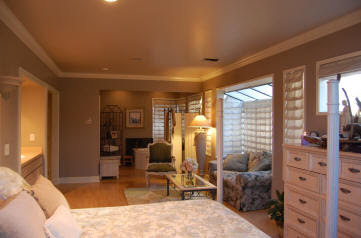 Suite 203, Kirkland WA. drdougendel.com in case you were wondering!). He clearly isn't a natural marketer or he wouldn't be sleeping on the job... but I guess we will keep him on payroll... or keep feeding him at least!